I’m going to state the obvious: there is nothing more refreshing than a tall glass of iced tea on a hot summer day. I know it, you know it, even my 6-year old niece knows it. Iced tea quenches your thirst and satisfies your desire for flavor. It’s one of those delicious flavors that just makes the summertime seem worth while. That and BBQs, doing things outdoors, Central Park Summer Stage, MoMA PS1, Water Fight NYC, and long walks on the beach. Just to name a few. Another thing we all know is that freshly brewed iced tea tastes way better than anything you’d find in a bottle or powdered mix. Everyone has a recipe for iced tea and a trick or two up his/her sleeve to make THE best iced tea. I know it sounds crazy but a pinch of baking soda really improves the taste. It neutralizes the tannins in the tea, makes it less bitter, and gives it that "smooth" taste we all love. It's a family secret though, so I’m going to ask you to keep it between you, me, and well, the Internet. 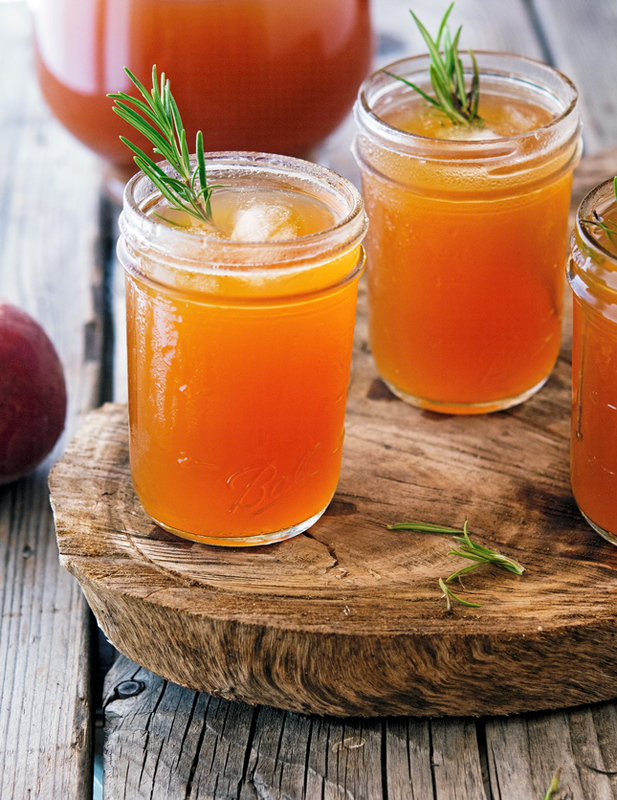 It’s a well known secret to many, especially in the South — where they know a thing or two about iced tea! If you’ve never tried it, I urge you to do it next time you brew iced tea at home. It’s really something. 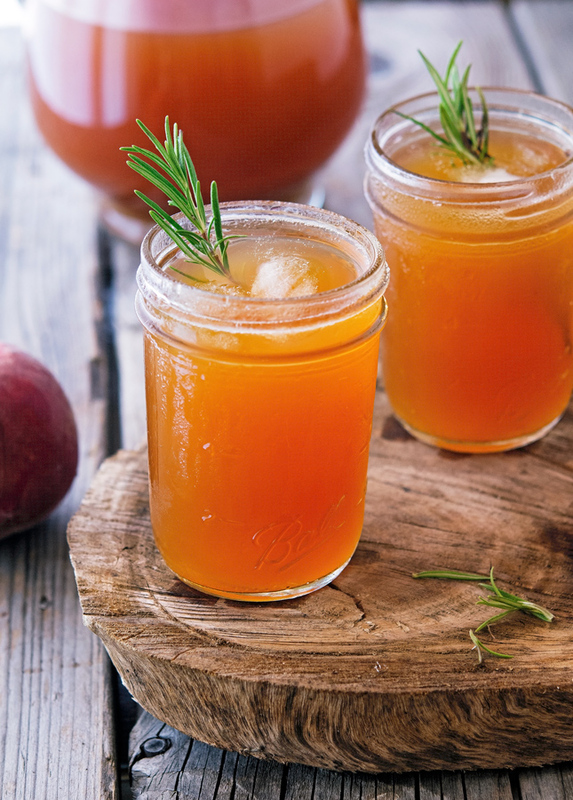 So what about this Rosemary-Peach Iced Tea? I would start by saying that it’s truly spectacular. The peaches are not infused in the tea as you might expect. Instead, they’re cooked with the sugar to create a sort of fruit jam, which is then strained directly into the tea. Rosemary is added at the very last stage to add that little je-ne-sais-quoi. You can think of this as a pepped up version of iced tea. It's so delicious I'm sure it'll become a favorite at your house, too. 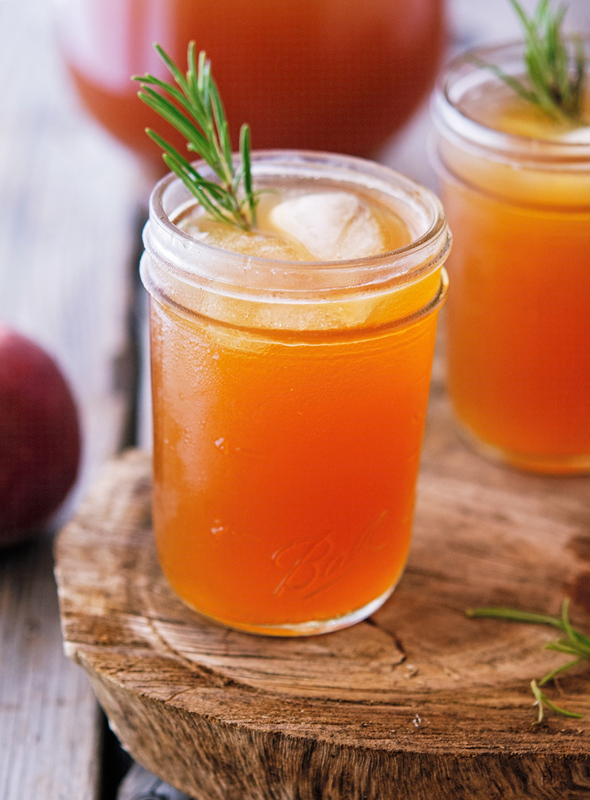 Rosemary-Peach Iced Tea Print this recipe! Note. I don’t like my iced tea overly sweet, ½ cup of sugar works for me, but feel free to play around. Remove the tea bags and set aside. 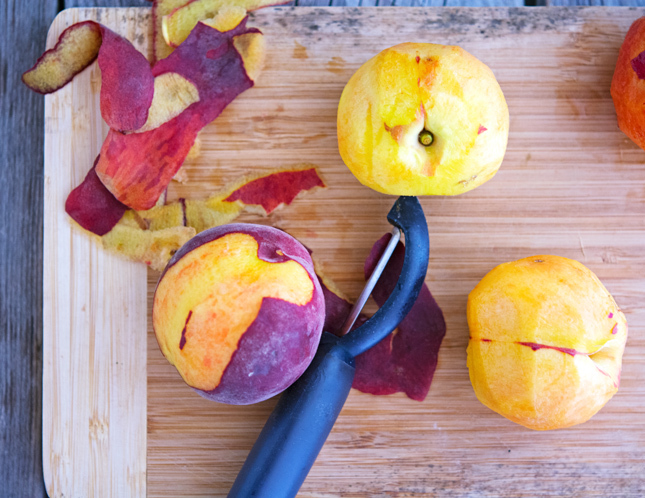 In the meantime, place peaches and sugar in a sauce pot and cook on medium heat until the peaches are bubbly and broken down. Puree the mixture in a food processor (or blender), then strain through a fine mesh strainer, directly into the tea. Add rosemary stalks, cold water, and baking soda. Mix well and refrigerate until cold. When I moved down to the States, I learned that your American Iced Tea is SO much different than our Canadian version! Yours is literally tea that is cold. Our is loaded with sugar and makes your teeth feel like they're rotting out of your head. Anyway, that's besides the point. Because this healthy refreshing version? I could sip it all day long! Pinned! It sounds and looks pretty spectacular to me to, yummers! Wowza- I LOVE everything about this tea! I feel strange even calling it just tea, because it's SO much more than that! It's fancy pants, taken to the next level, ALL sorts of delicious tea! And I NEED it! I'm from the south and ive never heard of adding baking soda to tea, but it totally makes sense!! I can't wait to try that! I love that you cooked the peaches with the sugar instead of infusing it, clever stuff my friend! And then you went and added rosemary.. because I wasn't already completely smitten (<-- I was!)! This is some stellar tea that will be made in my kitchen!!! ♡ Cheers! I've never heard of the baking soda tip, but I'll be putting that to use right away! You had me at rosemary (I've been putting it in everything lately) but it doesn't hurt that I'm on a peach kick right now too! Adding baking soda is a little trick that works wonders. If you try it, please report back! Mike, you may be a great fan of frittata, but I'm a huge lover of incorporating herbs in drinks and desserts. I mean, finally I found a niche to beat you, haha! Okay, may be not this year:) Love the combo of peach-rosemary. But soda?!! That's definitely something new! I'm intrigued. You have found a niche to beat me? Is that a challenge? If so I'm up for it. BRING.IT.ON. I love ice tea and rosemary but never thought of putting them together. Thanks for the inspiration! Glad I provided inspiration Bella! I love peach iced tea. I need to try this ASAP! I can confirm it works...very well! Who's Jenny? Jenny from the block? Well you're just taking peach tea to a whole new level!! Take that Celestial Seasonings Peach tea! My daughter LOVES iced tea and brews her version at home quite a bit - so I've gotta share that baking soda trick with her for sure! Thanks Mike! Great idea to cook the peaches down, I could drinkl this all day long. Pinning to make the SECOND I'm done with Whole30! I've put baking soda in for a while but... rosemary + peach? I can't wait for a gigantic glass! !